Beetles, spiders, and snakes were not the only delights that Rich and I saw as we hiked the lower stretch of the Ozark Trail’s Wappapello Section in early April. Entering the rich, moist, east-facing slopes overlooking the Black River valley, the oaks and hickories were still in the early stages of bud break. 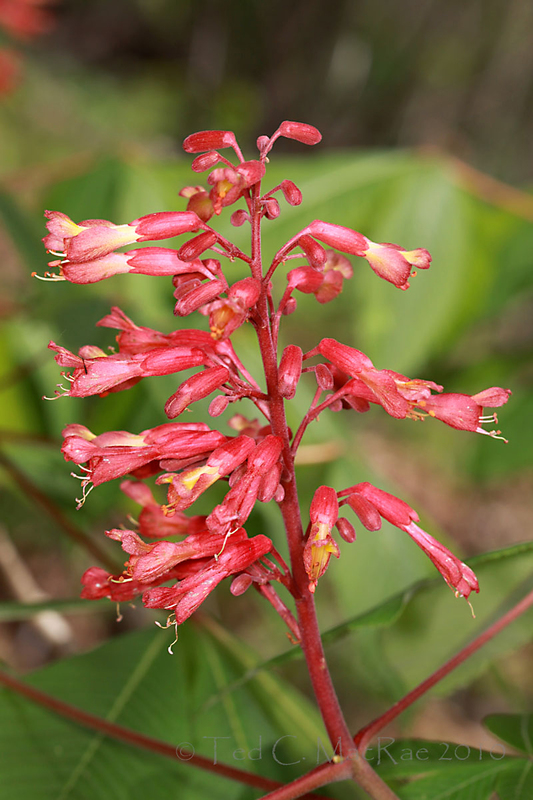 A lush, green understory, however, spread out before us, punctuated by the striking inflorescences of red buckeye, Aesculus pavia (family Hippocastanaceae). 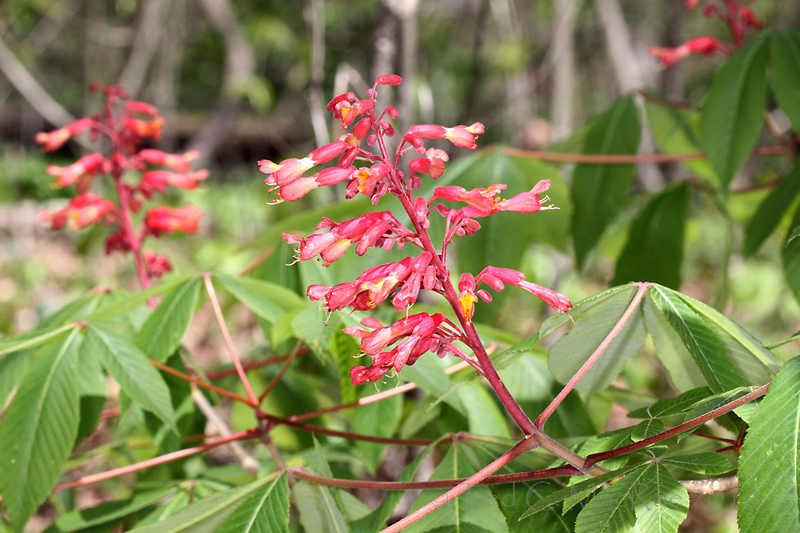 Among the first trees to bloom in spring, red buckeye is unmistakable in the field due to its red flowers and palmately divided leaves. I first encountered this species in 2001 along Fox Creek in the White River Hills of extreme southwestern Missouri. It was one of several species that I had selectively “cut” and left in situ for a season to allow infestation by wood boring beetles. I retrieved the wood the following spring and reared five species of longhorned beetles (family Cerambycidae) from the dead branches, including Astyleiopus variegatus, Hyperplatys maculata, Leptostylus transversus, Lepturges angulatus, and the prize – the very uncommonly encountered Lepturges regularis. All of these represented new larval host records; however, it was not until after I published those records (MacRae and Rice 2007) that I realized the plant itself was not known by Steyermark (1963) to occur naturally outside of the southeastern Ozark Highlands. Speaking of early spring flowers, many such delights can be found at Berry Go Round #27 which is now up at Mary Farmer’s A Neotropical Savanna. It’s not just spring ephemerals, however, as another Missouri blogger and I show that winter has it’s own botanical charms. Stop by and enjoy the feast! Steyermark, J. A. 1963. Flora of Missouri. The Iowa State University Press, Ames, 1728 pp. This entry was posted in Hippocastanaceae, Plantae and tagged Botany, chemical defenses, forest, Hiking, Missouri, nature, science, trees. Bookmark the permalink. What a striking bloom it is. Aesculus glabra is a hardy plant and is grown as an ornamental in Alberta…pity that the flowers are not as outstanding as A. pavia. Wow – how stunning. Is A. pavia a summer deciduous tree out there, ala our A. californica? Thanks, Ken. James is pretty spot on about whether they are summer deciduous. In any event, they are always among the first trees to drop their leaves. 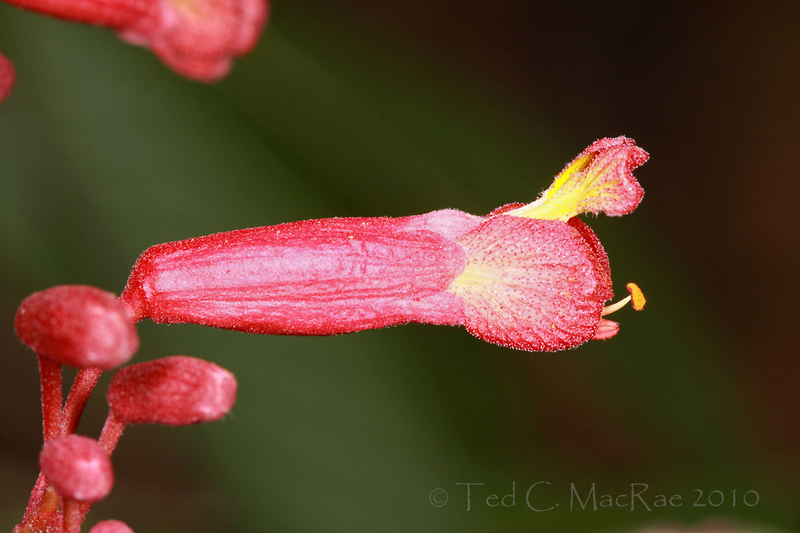 Recalling A. californica in the Sierra Nevada foothills makes me, once again, homesick for California! I usually see hummingbirds within a day or two of first noticing blooms on this plant. But the plants are early this year and the hummers on their usual, daylength-triggered schedule, so even with the buckeyes (and columbines and fire pinks) now ten or so days into their bloom, I haven’t seen a hummer! You’re right – I still haven’t seen a hummer yet either, now that you mention it. These plants were photographed on April 10 and had to have been in bloom for at least several days prior. We also saw lots of fire pink the same day. James answered the question I had…whether it attracted hummingbirds (as those lovely, long blooms hinted they must). That’s a truly stunning plant! Beautiful flowers, yes, but I also love the long petioles, and the interesting leaves! How nice to meet this tree. Thanks! Thanks, Mary. Yes, everything about this plant is lovely – almost has a tropical look to it! This post has been included in the latest edition of the Berry Go Round web carnival. Please visit the carnival and let other people know about it, click on the links, read everything, and help promote plant blogging! The plants can not do this themselves, people! Beautiful flower. Thanks for sharing!